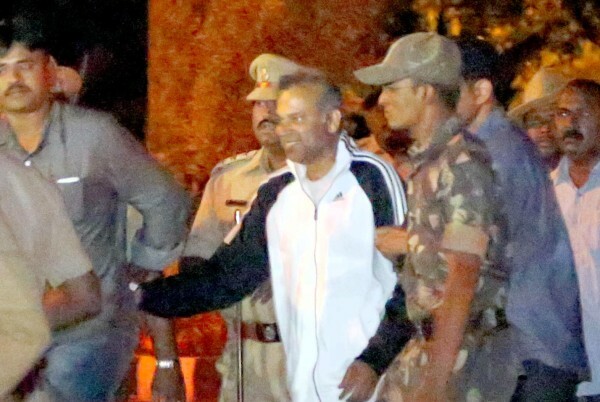 Underworld Don and Mangaluru-based fugitive Bannanje Raja was brought to Belagavi by plane on Friday evening and was produced before the Trial Court of Karnataka Control of Organised Crimes Act headed by District Principal & Sessions Judge P. Krishna Bhat. Bannanje Raja was arrested in Morocco in February and handed over to Indian police by the Interpol recently. Court has sent him to police custody until August 28. Raja, who was wanted in 44 cases and was on Red Corner Interpol alert for the past four years, was produced in the KCOCA court of Belagavi in connection with the murder of BJP leader and entrepreneur R.N. Naik in Ankola in December 2013. He was the prime accused among the 13, nine of whom are already arrested and incarcerated in Hindalga Central Prison in Belagavi. One of the accused was housed in Kalaburgi jail. The court remanded him to police custody till Aug.28. The police team headed by the Superintendent of Police of Udupi Annamalai K. left Belagavi for Udupi soon after the court handed the accused to the police custody.